Longitude: 6° 11' 6" W. Latitude: 53° 35' 15" N.
Situated on a communal green in the centre of a new housing estate in Balrothery is the rather handsome looking standing stone pictured above. The stone is standing on a small knoll, which gives this monolith the appearance of being much taller. At only 1.3 metres in height the stone is actually quite bulky. I do hope this stone is treated with due respect, but I have the feeling it may end up being used as a goalpost. There is also another standing stone, pictured right, located in the grounds of the nearby church, this stone has been re-used used as a grave marker and now bears an inscription dating to 1731. Obviously the idea about recycling has been with us for quite a while. The church at Balrothery, from the irish 'Baile na Ridire' (Town of the Knights), has a medieval defensive church tower built at the western end of the church. In the image shown left you can see the square tower with a circular stair turret on its western side. The only thing that may remain from the medieval church is a wonderful 'mouth puller' pictured below, that has been built into the walls of the present church which was built onto the tower in the 19th century. The mouth puller is located at the eastern side of the church just above the inscribed stone. There are also a number of early grave markers located around the grounds of the church. Situated: From Dublin take the M1 north, then take the first Balbriggan exit and follow the signs to Balrothery. The village is located on your right, as you leave the main road the church is located on your right as you enter Balrothery. 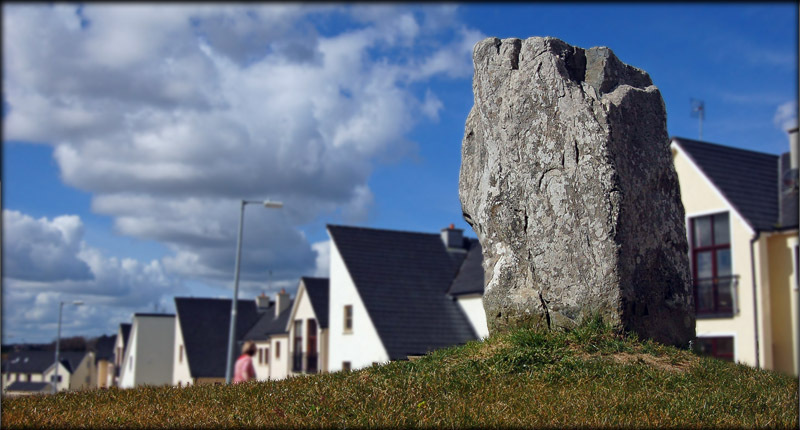 For the standing stone, drive passed the church and turn left, then take the second right, the stone is approximately 150 metres up this road. Discovery Map 43: O 1986 6115. Last visit Mar 2008. Longitude: 6° 11' 24" W. Church.